Applications received by January 15, 2015 will receive full consideration. The position will remain open until filled. The Large Binocular Telescope Observatory is looking for an experienced AO Scientist who is familiar with AO systems and their operation for routine astronomical observing and the commissioning of new instruments and AO capabilities. 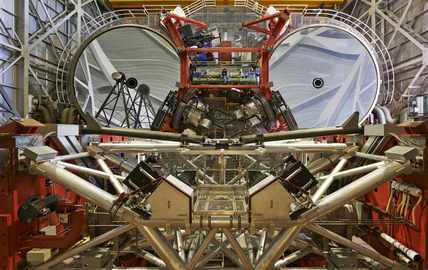 The LBT is a unique telescope with two 8.4m mirrors on a common mount which can be combined to form an interferometer with a baseline of 23m providing unprecedented ground-based resolution at near- and mid-infrared wavelengths. The AO systems are also unique and comprise two permanently mounted adaptive secondary mirrors (ASMs), each with 672 actuators. These enable high-Strehl ratio performance for narrow-field natural guide star (NGS) AO and wide-field “super-seeing” with laser-guide star (LGS) Ground Layer Adaptive Optics (GLAO). Additionally the two corrected beams are interferometrically combined for 23m resolution. Over the next few years, the Observatory will be commissioning routine NGS AO operation for near-IR imaging and spectroscopy and LGS/GLAO for high SNR wide-field NIR-imaging and spectroscopy. Additionally, the AO systems will be upgraded with improved wavefront sensing capability. This position reports to the AO Science Group lead. While most work will occur at the LBTO offices in Tucson, there will be significant amounts of work at the LBT site on Mt. Graham at an elevation of 10,470 feet. The University of Arizona offers a superior benefits package including significant tuition reduction at all three of the State of Arizona public universities to employees, their spouses and children. Duties: The successful candidate will be heavily involved in the routine operation of the AO systems, the commissioning and handover of new capabilities and the development of more automated and robust operation, without a loss in system performance, as the Observatory heads towards queue observing. They will also be involved in close interaction with the LBTO/AO engineering support, the AO development teams of the LBT partnership as well as the astronomer/observing teams. - Ph.D. level degree, or equivalent experience. in Astronomy or a similar field. - Experience in the use of adaptive optics for astronomical research. - Good verbal and written English communication skills. - Experience and knowledge of adaptive optics systems, both hardware & software, would be useful.